One of the projects that has been under way all summer is sorting through the estimated 16,000 uncataloged books and periodicals currently housed in our offsite storage facility — The Bunker. The story of The Bunker is a fascinating one, but today’s theme is the bibliographical gems we keep turning up as we work our way through the backlog. As with many of the great books in our collections, this item was given to Amherst College by an alumnus. Wilfred B. Hadley (AC 1921) purchased this volume while visiting Paris and donated it to the college in October 1971. 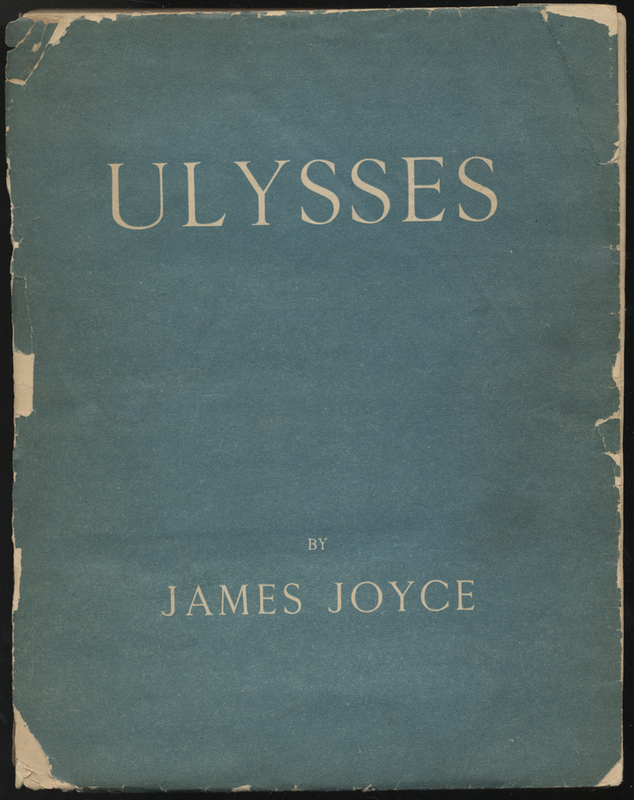 I was particularly excited to discover that this copy is in its original blue and white paper wrappers, unlike our other copy of the 1922 Ulysses, which was rebound in cloth. Although the copy shown here is not in perfect condition, it is wonderful to have this book in its original binding. Another difference between this copy and the other first edition in the collection is that this one is number 479 of the original print run of 1,000 copies. Copies 1 through 100 were printed on Dutch handmade paper and signed; copies 101 through 250 were printed on Vergé d’Arches paper; copies 251 through 1,000 were printed on “handmade paper.” We now have two of the three states of the first edition: number 209 and number 479. This copy is clearly not in its original binding, but it is a beautiful example of decorative leather bookbinding. 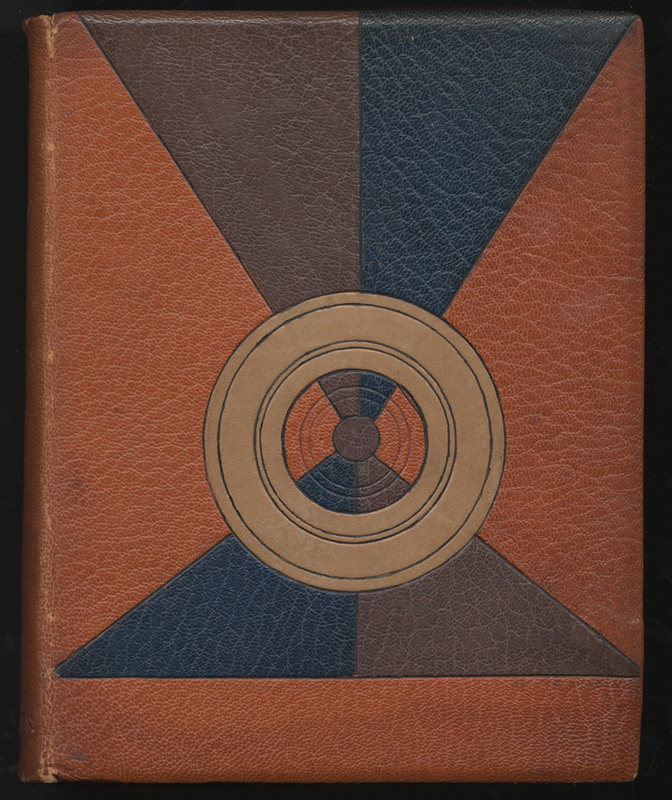 I searched the whole of the binding and throughout the book for some clue to the identity of the binder who executed this design, but there isn’t so much as a binder’s mark or initials or anything. If anyone out there has a clue, or even a wild guess about this binder, please let us know. What we DO know about this copy is that it belonged to a classmate of Wilfred Hadley — Morrill Cody (AC 1921). 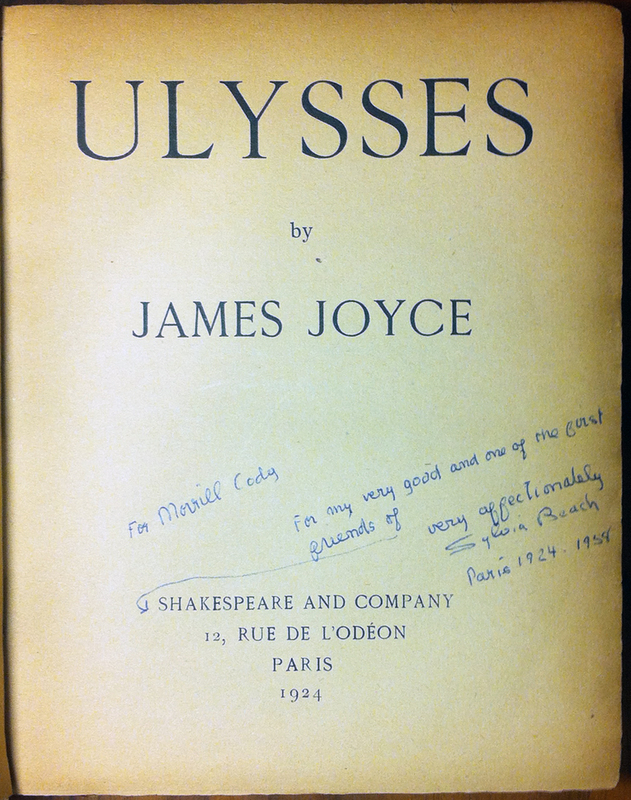 As you can see from the inscription on the title page of Morrill Cody’s copy, Sylvia Beach — proprietor of Shakespeare and Company and publisher of Ulysses — considered him a dear friend. This volume is a perfect complement to the Morrill Cody Papers held by the Archives & Special Collections. The list of correspondents in the Cody Papers reads like a Who’s Who of Paris in the 1920s: Sylvia Beach, e. e. cummings, Marcel Duchamp, Ernest Hemingway, Langston Hughes, Marianne Moore, Ezra Pound, Raymond Queneau, Eleanor Roosevelt, Edith Sitwell, Alice B. Toklas, and William Carlos Williams. Morrill “Bill” Cody was born in Lake Forest, Illinois on April 10, 1901, the son of Sherwin Cody (AC 1889) and Marian Hurley. He attended secondary school in France. After graduating from Amherst College in 1921, he returned to Paris as a journalist, living and working with the American artists and writers of the “Lost Generation.” In the 1930s, Cody worked as a magazine editor and writer in New York, contributing to the Literary Digest among other publications. He published This Must Be the Place, a memoir of Montparnasse, in 1934, and Passing Stranger, a novel, in 1936. At the time of his marriage to Marion Holbrook in 1935, he had a son, Malcolm Peter (b. 1925). His daughter, Judith Alden, was born in 1936. Cody joined the Foreign Service in 1941, holding diplomatic posts in Paraguay, Argentina, Mexico, Washington, Paris, Stockholm, and Madrid. In 1960 he married Jane Hoster, and had another daughter, Gabrielle Hamilton Cody. Before retiring from the Service in 1963, he served as assistant director of the United States Information Agency under Edward R. Murrow. In his later years, Cody headed the Paris bureau of Radio Liberty/Radio Free Europe, and wrote two more books, The Favorite Restaurants of an American in Paris (1966) and The Women of Montparnasse (1984). Morrill Cody died in Maryland on November 23, 1987.